In August 5th, Part 1 (click here to read), the basic concept of the Valley of Decision was briefly spoken of. Yes, it is a valley which comes to each and every human who comes into the world. Listen… “That was the true Light, which lighteth every man that cometh into the world.” John 1:9. As this above verse reveals, every man, woman, and child who is born into this world will have opportunity to decide whether or not to worship the true Creator/Redeemer God. Now as we look into the night heavens in mid-Summer through Fall, the Lord has created a constellation group to represent this Valley of Decision concept! It appears as two mountains, with a valley between. One Mount represents the Mount Gerizim, the Mount of Blessings, and the other represents Mount Ebal, the Mount of Cursings, as spoken of in Deuteronomy 11:29. And so these two mountains represent the blessings which come to those who obey God, or the cursings which come upon the disobedient! OK, so this is a really simple concept! Blessings for the obedient! Cursing for the disobedient! Not much to get mixed up with! But Satan is not satisfied with such an either/or choice! No, Satan has made it his chief goal to confuse the issue! And so he has created the societies of the world to make it seem as though there is a third alternative! In other words, Satan has designed this world to be a place of exciting and intriguing people, places, and things to do! It is a world of selfish pleasures and self-promoting ambitions! And yet, the people to a great extent are seemingly moral and law-abiding. Very confusing, to say the least! And so, if you look carefully, there is a third mountain to the right. And in the night-sky, it is to the south of the other two mountains. You see, this third mountain is called, “O Destroying Mountain, Babylon Constellation”. It represents the kingdom of Satan, which he has created this world to be. Yes, Satan has done an incredible job of creating this world to be a sort of alternative choice to God’s universal kingdom of unselfish love! Satan, however, offers Mankind his own kingdom: a kingdom of selfishness in which a person can “do his own thing”, as the saying goes! The problem is, while God’s kingdom leads to life everlasting, Satan’s kingdom leads to destruction and finally, death. As you can see in this drawing, there appears to be a highway going straight downward to the Revelation 12 Dragon. This Dragon represents Satan. And you will notice a five-star wheel-like configuration which appears to be rolling down that highway toward the Dragon. Well, that represents the Five Foolish Virgins, as foretold in Matthew, Chapter 25. These Foolish Virgins represent all those who begin the Christian life, but who still try to hang on to the pleasures and proud pursuits of this selfish world. Yes, this five-star wheel is rolling straight down into the “belly of Hell”! Now, if you will also notice the oval-shaped object which appears to be making its way up the side of the Mount of Blessing (mountain farthest to the left). This object is actually the largest looking galaxy in the night-sky, commonly referred to as Andromeda. Well, this galaxy represents the Five Wise Virgins! And that same passage in Matthew explains that the Five Wise Virgins represent those who come into the Church, who use their time and means, to purify their hearts, in hopes of becoming transformed into the likeness of Jesus! And so, right up there in the night-sky, God has given us a picture of the basic concept of the battle-lines between Satan and his deceived, foolish captives, and God and His wise followers! WISE & FOOLISH VIRGINS IN WEST! Now, if this isn’t amazing enough, there is much more to all this! You see, on the other side of the night-sky in August and September, in the first hours of darkness, there appears another constellation group. And this group is also known as the Five Wise & the Five Foolish Virgins. They depict the very same Wise & Foolish Virgins which are in the east, in the Valley of Decision Constellation Group. Now all this is a lot to try to comprehend in one sitting. But this devotional will attempt to present just one more aspect to these two constellation groups. You see, the Five Foolish Virgins which are encircling the Crown, are part of a long snake-like constellation, which is called the “The Serpent of Old Constellation”. The head and jaws of this serpent is made of the same four stars commonly known as Draco the Dragon. Yes, the ancient astronomers got it partially correct, when they named this dragon, Draco! However, the body of Draco is completely different from “The Serpent of Old Constellation”. 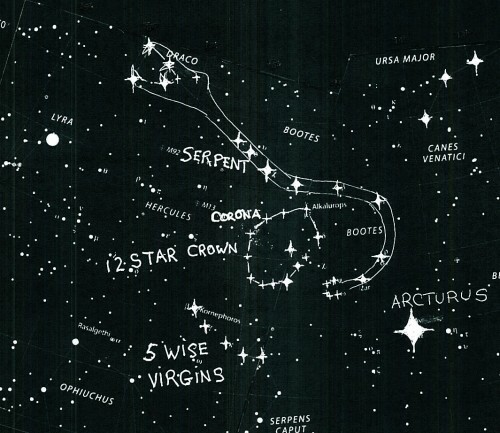 Now as you can see, the Serpent of Old Constellation appears to be heading straight across the heavens in the direction of The Valley of Decision Constellation! Now here is the really amazing part of all this! If you go out in the night, and find these constellations, you might be able to see that the two jaws of Draco are pointing in two very different directions! One jaw is pointing to the Mount of Cursing in the Valley of Decision Constellation. And the other jaw points straight to the Broad Way to Destruction which goes from the O Destroying Mountain, Babylon Constellation down into the Revelation 12 Dragon Constellation! Now the obvious message here is that God has created these two constellation groups to present a clear picture of Salvation of His Elect, wise ones, and the damnation of all those who foolishly try to hold on to this selfish world of sin! PICTURE : Serpent Points To Valley & Destroying Mtn.